You knew earlier that plants belong to the eukaryote group. They are multicellular and because they have chlorophyll, they can make their own food. Plants consist of two big groups: those which do not have tissues to transport water and food (nonvascular) and those that have this transport system (vascular). Liverworts, mosses and hornworts are nonvascular plants. They are attached to the places where they live by means of their root-like rhizoids. These rhizoids absorb water and nutrients instead of true roots. They also do not have true stems and leaves so they grow very close to damp grounds, stone walls or tree trunks. From studying water-dwelling organisms, you now will deal with ferns which thrive on land with true roots, stems and leaves. Ferns also reproduce by spores. More than 900 species of ferns can be found in moist, shaded and mountainous areas in the country. With the fern’s ability to make food, they too provide other organisms with food and oxygen. You are also familiar with the use of ferns as plant decoration. Some Philippine handicrafts are made from fern fibers like nito. Seed plants consist of those which bear seeds contained in cones and those inside a protective layer of tissue. 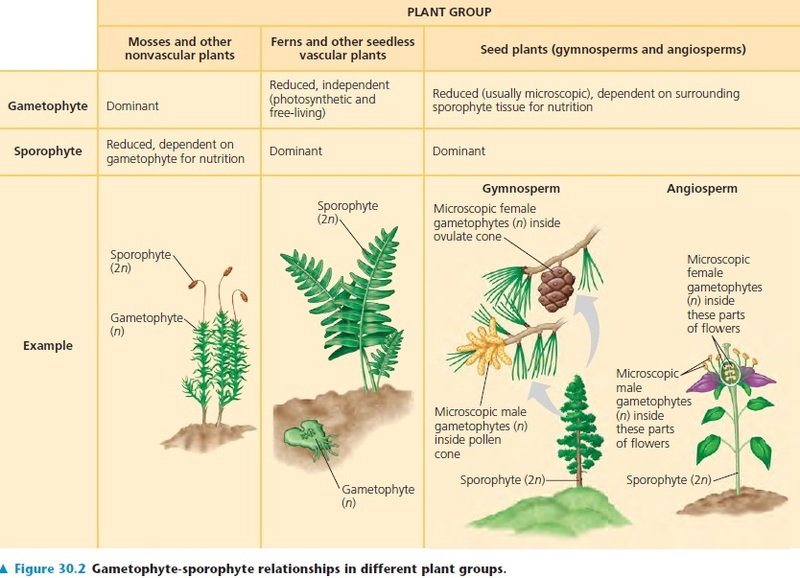 Plants whose seeds are borne in cones (Figure 15a) are called gymnosperms. Examples of gymnosperms are the conifers, cycads, ginkgoes, and gnetophytes. Many conifers like pine trees grow in cold countries and in elevated places in warmer climates. They are woody trees and have tough needle-like leaves. ​You are most familiar with members this group as you may have played with their flowers even at an early age. In the earlier grades, you have learned how varied they are in terms of parts and habitat. You also studied about what parts are involved in reproduction and ways by which they reproduce. They are also called flowering plants since flowers, as well as fruits, are involved in their reproduction and development. Flowering plants are also classified as to the number of cotyledons present in their seeds. Monocotyledons or monocots have only one cotyledon present, while dicotyledons or dicots have two. Look around you. Think of what you have eaten or what you have used earlier. Were there any from this group of plants mentioned that you have eaten, or in any way used? Angiosperms of importance worth mentioning are Filipinos’ staple food: rice for most of us, corn in some areas; vegetables like camote tops, malunggay, cabbage, carrots, saluyot and squash. ​Many angiosperms have been developed to prevent and cure some diseases. Lagundi, sambong, ampalaya, and banaba to name a few are now commercially available for specific ailments. Summarize the Plant Kingdom into groups, according to their transport system for water and food. What is the difference between a gymnosperm and an angiosperm? Differentiate a monocot from a dicot in terms of leaf venation, root structure, number of cotyledon, and floral structure. Give example for each.